starting with collaboration with musician,Kazuya Zenzai, at open air performance in Yokohama in 2009 as part of the Kazuo Ohno Festival, it associates Maki’s recent full piece “Reversible”in February 2010. TOWER is her new collaboration with him and it consists of live music play that centers on voice music. 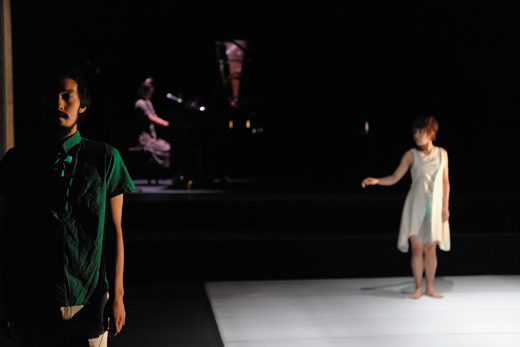 In July of 2010,TOWER was performed at Esplanade in Singapore and this work with grow up us a lifework of Maki TABATA in the future. This work can be presented i not only the theatre but also any public space. Tower of time piled up while playing by man,man,and woman’s bodies,voices,sounds,and spaces. The two dancers and one musician tick away the same moment by each method sharing the movement.